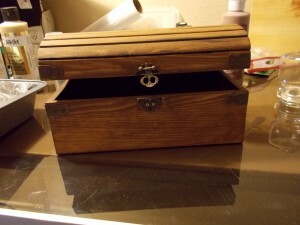 In January/February of this year- this box and a very good friend are what helped me keep it together. Oddly enough, this box was given to said friend as a parting gift. It sits here, halfway through the process of painting and antiquing it, as a place of grounding in my life. As long as I’m creating beauty in the world, somehow everything will magically turn out ok.
Well the paint didn’t make it down here from Bristol, but the sewing machine certainly did. I have what I need to work the costume for my January performance, so that’s what I’m going to do. Ladies and gentlemen, the shop is now open and the artist is IN. I couldn’t do it without you- your ooing and ahing and wondering what comes next. Thank you for being there for me. I’m honestly glad you’ve been able to change so much in your life. I think it’s for the best, and I look forward to how 2015 will be.